Charles Carver. Charles, Carver was born at Bolingreen, Mo., August 2, 1832, was united in marriage to Mary B. Howard, May 15. 1851. Nine children were born to them. 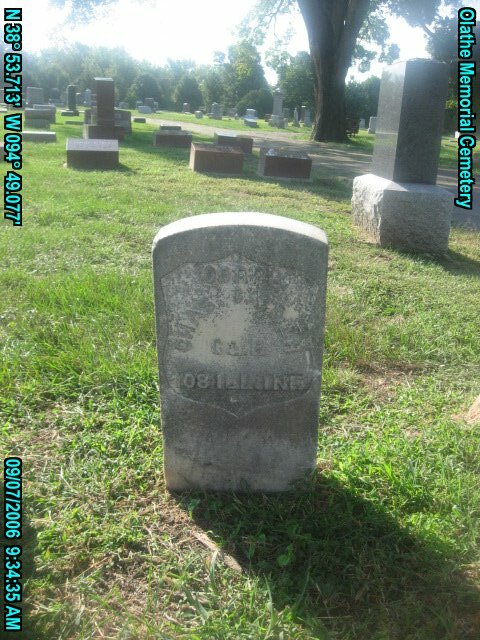 In 1862 he enlisted in the service of the U. S. in Co. H, 108th Illinois infantry, and served three years as corporal and passed through a great many hardships for the love of his country. He has often said that he has slept on brush piles and rail fences to keep out of the water in those southern swamps. That he had marched three days and nights with very little to eat. The battles he fought in, namely, Chickasaw, Bayou, Ark., Fort Post Gibson, Champion Hills, siege of Vicksburg, Gun Town, Ripley, Wolf River bridge, siege of Spanish Port. He was a farmer by occupation and always spoke of doing things well if done at all. He was always loyal to his party, Republican, always loyal to his family, a good husband and a good father, and loved everyone and everything that was honorable and just. He believed it right to go just as far to pay a man 5 cents as any other amount. He moved from Cass county, Ill., to Butler county, Kan., in 1868, took up a claim of 160, 18 miles northwest of Eldorado, and was there for about ten years, and moved on account of chills and fever, to Douglas county, Kan. From Douglas county back to Illinois. It probably was a question in his mind which was the best state to farm in, Kansas or Illinois, and after several several moves to and from, finally settled back to good old Kansas where he has lived since. Funeral services were''held at Frye Brothers undertaking parlors last Thursday.